Serious wagons are automobiles that can pack plenty of luggage carrying ability, can tow when required, offer premium luxury and perform with distinction. Enter the realm of BMW’s all new 5-Series Touring range. First of all, let’s look at the design package. BMW have created the 5-Series Touring wagon with very fluent and sporty lines. The long, low profile appearance makes for very good aerodynamics and tasteful looks that envelope plenty of space and practicality. One of the best looking wagons on the road, the BMW 5-Series Touring range has what it takes to top the most desirable station wagon list – though the Audi wagons look very good, as well. There is a good wallop of chrome used for detailing purposes on the Touring wagon’s exterior. Retained for 2011, are BMW’s beautiful head lighting arrangement and shapely bodywork. Extended at the back, but by no means an afterthought, the luggage area offers a deep and high luggage area finished with sporty taillights, a tightly tucked rear-end, twin chrome exhaust tips and a spoiler. Inside the faultless interior are premium materials, wonderful build quality and sumptuous comfort for five occupants. One of the things you notice when climbing on board any new BMW is that the seats seem to fit perfectly about your body, the switchgear is ergonomically sound, the very best luxury features (like high-end sound systems, electrics, communication systems, onboard computer systems, four-zone climate air-conditioning etc.) are standard equipment. And the cabin is whisper quiet. There is even a rear entertainment system for the back seat passengers. On the road, the ride is superb and the cabin silent. A driving enthusiast’s dream, the BMW Touring models are all capable of spirited driving and flawless dynamics. Stopping ability is awesome, while the get-up-and-go quality is both refined and supremely powerful. Now available with an eight-speed auto box, the progress is always smooth and always ready to perform. BMW offers all the best safety items, and with features like Heads-Up display, active cruise control, camera systems to aid parking, passive safety, a lane change warning system and BMW’s excellent Night Vision system this wagon gets a huge big tick for safety. And on today’s busy roads, safety is always going to be a big winner. At the heart of every BMW is a stallion waiting to be given the chance. Potent engines provide the very best performance, and with the BMW 5-Series models the engines are built for satisfaction. The BMW 520d Touring will be powered by the same 2.0-litre 135kW/380Nm motor found in the 520d sedan, while the 535i Touring boasts a 3.0-litre turbocharged inline six-cylinder petrol engine. Wagons are practical vehicles, so it’s worthwhile stating that the new BMW 5-series Touring has the longest wheelbase in its class measuring 2968mm. With an overall length of 4907mm, the BMW 5 Series Touring offers an immense amount of interior space with flexible seating for five occupants and a large carpeted rear luggage space. The rear seat back is split folding in a 40/20/40 arrangement. Luggage capacity ranges from 560 litres to 1670 litres. 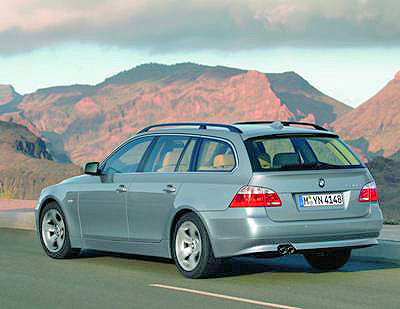 Stand out form the crowd, and drive BMW’s awesome looking Touring wagon. It is sure to please. For any more information on the BMW Touring wagon, or for that matter any other new car, contact one of our friendly consultants on 1300 303 181. If you’d like some fleet discount pricing (yes even for private buyers!) we can submit vehicle quote requests out to our national network of BMW dealers and come back with pricing within 24 hours. Private Fleet – car buying made easy!